Earlier in this chapter I showed you how to add captions, notes, and audio captions. I referred to the Properties pane as one vehicle to use when adding these identifiers. But I didn't give the Properties pane its full due. In addition to displaying your captions and notes, the Properties pane lets you see everything you've done with the file, from when and where it came from to whom you shared it with and more. 1. Select your desired photo in the Photo Well. 2. Choose ViewOProperties to bring up the Properties pane. You also can right-click and choose Properties from the context-sensitive menu or click the Show Properties button in the Options bar. You immediately see any caption attached to the image, the filename, the location of the file, the size of the file, and the date and time of the file. 3. To play an audio annotation, click the audio button (the speaker icon), and click the Play button in the audio window. 4. Click the Complete Metadata button (the "i" icon), if it is available, to see all EXIF (Exchangeable Image File) data in a separate window, shown in Figure 6-6. 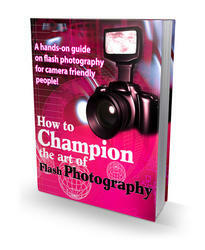 Metadata is extra information that some software programs or digital cameras store as part of the image's file format. Metadata includes the caption (if there is one), the camera's make and model, resolution, and other data. 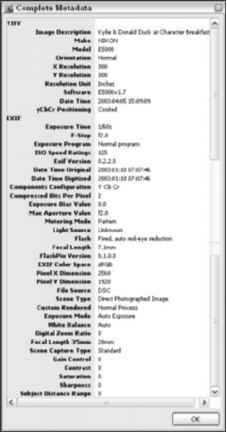 EXIF is a variation of the JPEG file format (see Chapter 3 for more on formats) and contains information such as your camera's aperture, shutter speed, exposure and other settings. • Brief Metadata: This option gives you an abbreviated version of the Complete Metadata profile. 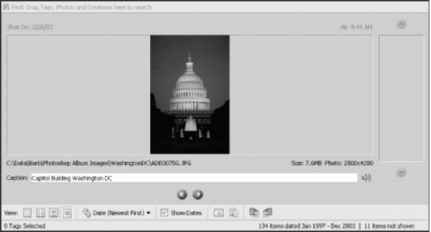 • History: This setting shows you the date a photo was imported and modified, where you imported it from, any creations that use the image, when and how it was shared, and if and when it was printed. I bet you didn't know your images were under surveillance, did you? • Tags: Selecting this option displays any tags attached to the file. For more on tags, check out Chapter 5. You also can view information about a file by double-clicking the image thumbnail in the Photo Well to display the image in a Single Photo view. Make sure the Show Dates option is checked in the Options bar (or choose ViewOShow Dates and Tag). You can then see the caption, the file's location, the size of the photo, any attached tags, and the date and time the photo was taken (see Figure 6-8). You also can listen to an audio caption if one exists. The Properties pane gives you a full history of where your image has been. The Single Photo view gives you some, but not all, data about your image. If the only information you're interested in is the date, time, and tags of an image, you can get that in either the Medium or Large Thumbnail views in the Photo Well. The Small Thumbnail view yields only the date and time a file was created. For more on viewing images, see Chapter 9.